If you are planning for advertising hoarding, and need to put up building site hoardings or scaffolding, on public roads or pavements, you have to obtain a license from the Council however if you wish to advertise on the building hoarding you often do not need planning consent. Adverting on site hoarding is a very effective form of advertising the building project and will start the marketing of the building project straight away. We produce the colourful printwork which go onto the hoarding structure and many different solutions to suit your requirements. Our recommended building hoarding solution would be digitally printed self adhesive vinyl laminated with an anti graffiti film and then mounted onto a 3mm aluminium composite commonly known as Dibond, Alucobond or Reynobond. The aluminum composite flat panels consist of a core commonly a low density Polyethylene bonded between two aluminium sheets. Aluminum sheets can be coated with PVDF or Polyester paint. ACP (aluminium composite panel) is very rigid and strong despite its light weight. The aluminium panel can be painted in any kinds of colours, and ACPs are produced in a wide range of metallic and non-metallic colours as well as patterns that imitate other materials, such as wood or marble making it ideal of building or site hoardings. The Anti graffiti film is a clear 30-50 micron polyester or polypropylene film which has a 1 to 3 year outdoor life depending on the grade. The film will not stop vandals graffiti the hoarding but in the event that it is, the graffiti can be cleaned off using a solvent and will not damage the printwork underneath. As you can see from the many examples of our work we can get very creative making a practical eye catching advertisement which will last for the duration of the building project. 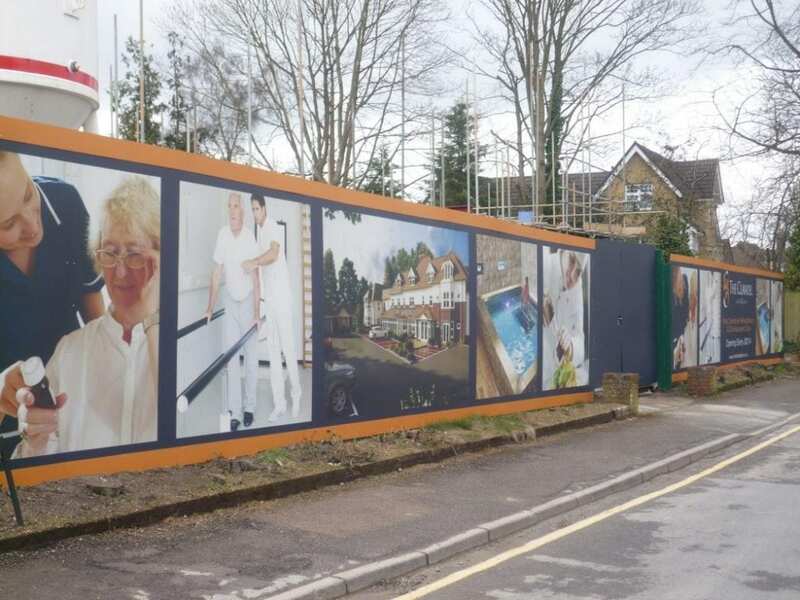 Other types of hoardings we produce, is using Smartply Site Protect board which is an improved moisture resistance 18mm x 2440 x 1220 OSB/3 coated panel with and a polymer surface treatment giving us the ability to mount a digitally printed self adhesive vinyl onto the board. The boards can be mounted in our factory and delivered direct to site for the fence or hoarding erecting company to install, saving on duplication of labour. By law, you need to put up hoardings to separate building works from the street, and to ensure that they are securely erected. If you do not do this, you could be fined up to £5,000 (non-compliance with scaffolding license). Most types of outdoor advertisements are covered by the rules set down by the Government, which control their display. The main types excluded from control include: those displayed on enclosed land or inside buildings and not visible outside those displayed on moving vehicles or boats and advertisements which form an integral part of a building’s fabric. In addition, notices, such as those giving information about local, parliamentary and European elections, road traffic signs, national flags, the flags of European Union, the Commonwealth, the United Nations, English County flags and saints’ flags associated with a particular county do no require consent. All outdoor advertisements must comply with five ‘standard conditions’. Many other types of advertising benefit from what is known as “Deemed Consent ” and you don’t need to submit a formal application, subject to certain restrictions. “Functional Advertisements” by bodies such as the government departments and agencies and the City Council about their services or Metro bus timetables on bus stops. Signs on and giving information about business premises, places of worship, educational, recreational or cultural establishments. Advertisements on the forecourts of business premises, including shops, restaurants, cafés and petrol filling stations. Temporary advertisements, including estate agents’ boards, contractor’s signs on building sites, adverts for local community events but not of a commercial nature) and poster-hoardings which are being used to screen building while the work is being carried out. Direction signs to house building sites and advertisements, including flags at the sites themselves. If your proposed advertisement or sign is not excluded from control and does not meet the “Deemed Consent” criteria, you must apply for “Express Consent”. Your application should be accompanied by a location plan of the site and details of the position and appearance of all advertisements and signs for which consent is being sought. Express consent will usually last for 5 years from the date it is granted, unless it is one of the types specified as being for a shorter temporary period, although this period can be varied. Although it is not a statutory requirement to do so, the council does publicise applications for advertisement hoardings (but not those for other signs) in the same way as planning applications and take the comments made on them into account in making a decision, subject to them relating to relevant policy, amenity and public safety considerations. Application Fees are set nationally and are the same throughout the country. It is a legal requirement that fees are paid before an application can be decided. See the link to “Application Forms and Guidance Notes” on this page for the current schedule of fees. A plan or plans, drawn to an identified scale which identify the location of the site by reference to at least two named roads and show the direction of north and show the location(s) of the advertisement(s). No application will be decided until all the information and fees required have been provided. A receipt is always provided for the fee and we acknowledge all applications that have been registered. The acknowledgement will identify the case officer who will deal with the application and advise you of the target for deciding it. The council has a target period of 8 weeks for deciding applications for Advertisement Consent. You can normal monitor the progress of your application on the councils website. Negotiations and amendments: The sites of all applications are visited by the case officer, who will check the information in the application and that, if a site notice is required, it has been displayed. If there are any problems with your application, which it is possible to amend without major alterations to your scheme, the council will try to negotiate this with you. Making the decision: Most decisions are made by a senior officer. Occasionally, particularly controversial applications may be decided by a panel of Councillors. They are presented to the members and considered in the same way as planning applications. The decision: They aim to send out your Decision Notice on the day that the decision is made. It will set out the reasons for approval or refusal of the application and, if permission has been granted, any conditions with which you have to comply. Amend and re-submit your application within 12 months without paying a further fee. Appeal to the Secretary of State within eight weeks of the date you receive the decision. Appeals are dealt with by an Inspector from the Planning Inspectorate, which is a Government Agency. Advice on how to appeal is sent to you with the Decision Notice. You can make changes to the content of the advertisement itself without the need to make another application. However, you cannot normally make other changes to its size, appearance or siting or add or change any means of illumination that did not form part of the original consent, unless further consent has been obtained. Where express consent is needed and an advertisement is being displayed, or conditions have not been complied with and this is causing serious harm to amenity or public safety, we will ask for it to be removed within a specified period. If it continues to be displayed, we will consider commencing formal prosecution proceedings. In considering the action to take, the coucil will consider the advice given in PPG 19 (Outdoor Advertising Control). 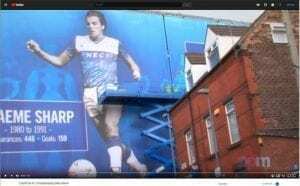 Where an advertisement has been displayed without express consent causes serious harm to amenity or public safety we will ask for it to be removed. Where it continues to be displayed, prosecution proceedings will be commenced. Where a retrospective application for express consent has been refused and the advertisement continues to be displayed, proceedings will continue even if an appeal has been lodged. To apply for a hoarding, license, please contact your local council. • The approximate height and length of the hoarding or scaffolding. • The main dimensions of the hoardings, scaffolding, cranes or containers over the public highway. You will also need a copy of your public liability insurance cover which needs to be for a minimum of £5million. You need a separate license for hoardings, of scaffolding. The cost of licenses are reviewed yearly in April. For the year 2011/12, each license costs £120. Please note that you will also need to pay a refundable deposit. 1. A Council Engineer will come to inspect the location. 2. The Engineer will decide on the size of the refundable deposit (in addition to the standard license fee) that you will have to pay. This deposit is to cover any damage that may be caused. 3. You will be required to pay your deposit and license fee in advance, either by cash, cheque or Council approved credit or debit card. 4. When they council has received your payment they will issue you with a license. 5. When you have completed your building work, you will need to contact the council again. 6. The council Engineers will revisit and inspect your site. If the hoardings, scaffolding, have not damaged the road or street, we will return the deposit to you. If you have damaged the highway, the cost of repairing the damaged area will be deducted from the refunded sum. For more information on Planning for advertising hoarding contact the council will tell you all the conditions attached to the license when issued.